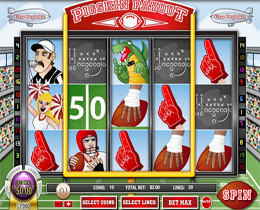 Pigskin Pay out is a video slot machine game with a “Football” theme. There are five spinning reels from which to form winning combinations. For every coin you insert, another pay line will activate. When the reels stop, the computer checks the combinations along each enabled pay line. Every Free Spin is a guaranteed win, but with two reels completely wild on every spin, it's even more likely to hit large wins. The Pigskin Pay out can be played for free or for real money with bets ranging between $/£/€ 0.01 and $/£/€ 0.10 per line and bet 1 up to 10 coins per pay line bet. The minimum betting amount is $0.01 and the maximum betting amount is $20.00 per spin. The maximum pay out in the Pigskin Pay out multiline slot machine game is 7,500 credits per line bet.